Limes offer similar health benefits. They’re a good source of vitamin C and potassium, aid digestion, are good for your skin (both internal consumption and when applied topically), and contain compounds (limonoids) that fight against certain cancers. The yogurt rounds out this recipes with some healthy fat and protein and provides that signature smoothie creaminess. The recipe below calls for a tangerine. Feel free to substitute an orange, mandarin, or tangelo. Lemon can also be used in place of a lime. I made this smoothie with ingredients I had on hand and encourage you to do the same. You probably won’t need to use a sweetener if you use a flavored yogurt. Enjoy! 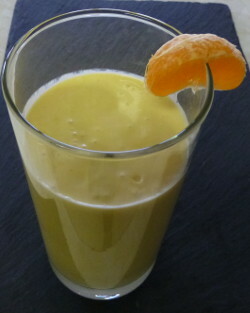 I’d love to know if you try this citrus yogurt smoothie and how you liked it. Please leave a comment below. Happy Blending! All of my recipes are approximately one large serving. However, serving size will very from person to person depending on things such as age, lifestyle, and health goals. My advice is to experiment and find the portions that work for you.